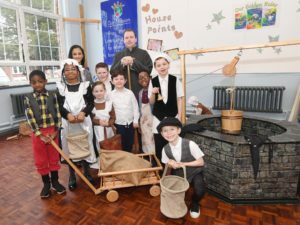 History came to life at a Coventry primary school as children dressed up in period clothing and learned all about the Great Fire of London thanks to a specialist history teaching company. Year Two pupils at Sacred Heart Catholic School, part of the Romero Catholic Academy, were visited by ‘History Off The Page’ – a teaching company which visits schools to provide fun, practical lessons about a variety of historical topics. The children enjoyed re-enacting what life would have been like on Pudding Lane – where the fire started – in 1666. In the morning, the pupils tried their hands at various trades common to London at the time, including candle making, haberdashery and bread baking. Later in the afternoon, the fire was simulated through the use of a smoke machine while pupils had to try and tear down ‘debris’ and find legal documents to help start rebuilding the city. The pupils were helped on the day by sixth formers from Cardinal Wiseman Catholic School – also part of the Romero Academy Group – who are studying history themselves. Phase Leader of Year One and Two, Lauren Roberts, felt the day was a great way to engage the children in their studies in a unique way. She said: “We have a thematic curriculum at Sacred Heart, which means our pupils focus on a particular topic, such as the Great Fire of London, across several subjects. We’ve covered it in history, geography, English and science. “We always like to try and incorporate days like this for the Year Two pupils around three times a year if we can. “Getting History Off The Page in was brilliant – the children almost didn’t realise they were in a history lesson as they were having so much fun. And Sacred Heart’s Principal Paul Madia said a day like this was an example of a ‘wow day’ – where the school puts on special lessons which the children will remember for a long time. “We try to end topics covered in our curriculum with a special day like this,” he said. “History Off The Page did a brilliant job of keeping the children engaged throughout the whole day – they were fantastic. “At Sacred Heart, we feel it’s very important to not only have regular, high-quality lessons, but to have days which are a little different which stay in our pupil’s memories.